Marvel Two-in-One #41: Voodoo and Valor! Up early in the morning, Ben heads for T'Challa's, only to find the door open and a costumed man nosing around inside. The guy disappears in a puff of smoke, and reappears to try to convince Ben to talk with him. Introducing himself as Jericho Drumm, a.k.a. Brother Voodoo, he tells Ben he's been investigating the same disappearances that Ben and the Black Panther were looking into last issue, and shows Ben the list of prominent individuals that Ben and T'Challa had been waiting for. The Black Panther is on the list, and based on the signs of a struggle, has obviously been kidnapped too. Pg. 23, panel 7. After having his jet shot out of the air, a rather annoyed Ben burst through the security gate and into the compound. "Awright, ya lousy crumbums-- It's Clobberin' Time!" --- This is the original art, from your editor's personal collection. Hey, I have an MTIO art collection, I had to have an "It's Clobberin' Time! ", right? Besides, its also got Brother Voodoo, Idi Amin, and Ben walking away from yet another crashed jet! This is the second part of a two-parter that started in MTIO 40. The airport that everyone leaves from is Slifer Field, obviously named after Roger Slifer, who plotted both parts of this story. One of the bad guys, Dr. Kinji Obatu, was better known as Dr. Spectrum of the Squadron Sinister, though he no longer has his power prism at this time. W'Sulli, the witch doctor, also previously appeared (along with the Zuvembie) in Marvel Preview 12. Idi Amin, of course, was the real life dictator of Uganda. 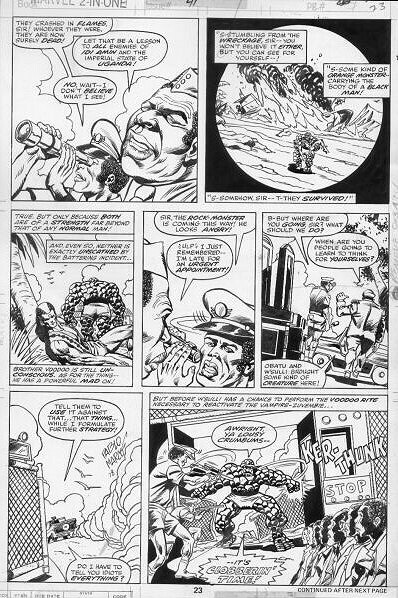 The Zuvembie, unnamed here or in his earlier appearance, is given the name of "Nightspawn" in the Fantastic Four Encyclopedia, years later.